David Blackburn of UK based Screenhaus Design has over 20 years experience in garment printing. Sublimation printing is particularly suited to short runs and full colour designs or photographs, printing onto white or light coloured t-shirts or running vests. Visit the sublimation clothing page for more details. All over sublimation printing is also available for t-shirts and material. Please use our contact form to submit your quotation or call 01604 714123 to discuss your requirements. 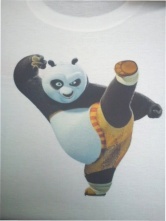 An excellent example of sublimation printing - a full colour print on a white t-shirt. The best results for sublimation printing can be achieved by printing on to white polyester clothing. There are now some garments available with a small cotton content or cotton feel. When a sublimation print is heat applied to a sublimation t shirt it is dyed in to the t-shirt to produce a permanent and photo quality image or logo that will not fade. The transfer is extremely durable and be stretched without cracking. A company logo can be sulimation printed on to white clothing to produce a photo quality and durable image. As well as t-shirts for men, women and children, polo shirts and sportswear garments are now available. Screenhaus Design will print on to customer supplied clothing wherever possible. To sublimate on to supplied clothing, the clothing needs to be polyester and white. Sublimation flock can sometimes be used as an alternative option. Personalised clothing is ideal for team or sports events, stag or hen parties, or as an individual gift. In this instance sublimation flock has been used alongside vinyl. Sublimation flock allows the production of full colour transfers with incredibly fine detail. Sublimation flock has a polyester base and gives prints that are extremely durable with a slightly raised texture for a quality finish. The flock can be applied to cotton, polyester and poly/cotton. This photo is ideally suited to sublimation flock and was printed on to the back of polo shirts with an embroidered logo on the front. Sublimation offers the opportunity to create corporate or promotional items or alternatively unique photo gifts or personalised keepsakes. This logo has been printed using sublimation flock because the requirement was for fairly small runs but with a full colour image plus text. To set-up for screenprinting would be costly due to the number of colours (and therefore screens) required, and also the volume required. Sublimation flock and vinyl are both versatile processes and can be printed on to different coloured garments. Many running vests, shirts and general sportswear are suitable for sublimation printing as they are 100% polyester. As long as the vests or shirts are white, then the logo can be directly sublimated on to them.